Looking for a tool to read a mystery CAD file with a .PRT extension? You’ve come to the right place. Kubotek KeyCreator 3D CAD and Spectrum CAD Viewer may be the best tools in the world to help you figure out what type of PRT CAD file it is. This is a common question because there are a lot of PRT files out there and CAD programs have been creating them since the 1970s! There are 4 families of CAD programs that have used the PRT extension. The most common PRT generating CAD program is likely CADKEY which was a popular mid-range program available from 1984. CADKEY used the PRT format for both drawings and 3D models. PRT files generated by CADKEY are not as common today because in 2004 CADKEY was superseded by KeyCreator which uses a CKD extension. KeyCreator and Spectrum are the only programs which include code directly from CADKEY and no other products will read CADKEY PRT files as completely. They can read CADKEY PRT files from version 5 on (circa 1991). The PRT extension has been used as a 3D model format by PTC programs starting with the high-end Pro/Engineer in 1987. This product was re-branded as Pro/E Wildfire and then Creo Parametric and continues to use the PRT extension. Kubotek programs will read all these files starting with Pro/E version 16 from around 1997. One clue that a PRT is from the Pro/E family is that the file name is appended with a .1, .2, etc. to indicate the file revision. Siemens PLM, another major CAD vendor, also uses the PRT extension as a 3D model format with its NX CAD programs. Use of PRT by this product family can be traced back to early days of CAD with Unigraphics. KeyCreator and Spectrum can open “UG” PRT files as far back as version 11 from 1996 up through the latest NX PRT files – including compressed PRT files other programs have a hard time with. Back in the mid-1990s when SolidWorks was developing a new Windows-based parametric modeling program they concluded that the world needed another type of PRT CAD file. 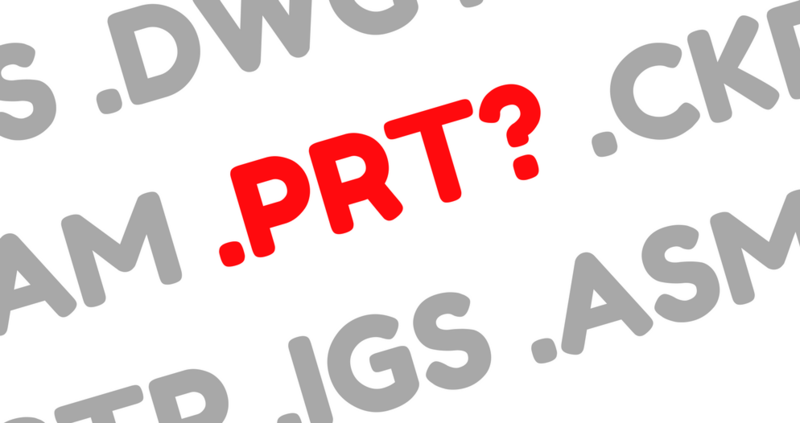 After a couple of releases dealing with confusion between SolidWorks, CADKEY, Pro/E, and UG PRT files they did the helpful thing and changed from PRT to the SLDPRT extension. Kubotek translators will read the SolidWorks format from version 98 and on. So if you have PRT files from a CAD program released in the last 20 years, KeyCreator and Spectrum will likely read them. John McCullough is the Marketing General Manager for Kubotek3D.